Spiritus Sancti albums are a compilation albums made of various Catholic Artists. Many different genres from pop to heavy metal are in the albums. Today's modern Catholic music is entertaining and uplifting. Father Adaly Rosado, Jr. created these albums in order to promote Catholic music and bring people to Jesus. The albums are FREE! Enjoy. Spiritus Sancti Volume 2 features Catholic CCM and Hip Hop. This year's artists are Kode Redd, John Levi, The Symbol, Full Armor Band, Ela Love Is All, Rabelz, Rob Official and C2Six! Click Here to download Spiritus Sancti Volume 2 for FREE! 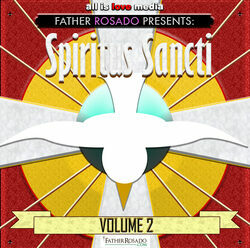 Spiritus Sancti is a compilation album made of various Catholic Artists. Many different genres from pop to heavy metal are in the album. Today's modern Catholic music is entertaining and uplifting. Enjoy the music.